Pre-NSDAP Reich propaganda poster depicting the strength imbalance between Germany and her neighbors. Ages ago I wondered why exactly did Germany and more importantly Hitler supposedly 'break' the Versailles Treaty and leave the League of Nations. Contemporary historians on the subject pretty much agree that the German government simply shook the chains off as a matter of course, which is fine as the Versailles Treaty itself was little more than a slave treaty. But did Hitler have justification for leaving the League and opposing the Treaty? I believe one of the most obvious pieces of evidence for this is in the very first article of the Versailles Treaty in its final June 28th, 1919 manifestation. Thankfully the entire document is provided online via Avalon so it can easily be accessed. France had a population of ~35m during peacetime between the wars. Germany have over 80m. Of course Germany's reduction is a specific addendum in the treaty but France was obligated by the treaty to reduce the standing military forces of 4-5 million it had during peacetime. That figure also happens to be the number of French members in the armed forces during the First World War. Simply put - Section I, Article 8 of the Versailles Treaty was not respected by anyone but Germany. After all, the German military, despite mewlings from Ludendorff, was more than capable of actually defending the Reich had hostilities broken out after the 11th November, 1918 armistice, potentially forcing the Allies into an impasse with Germany. However, the "Hun" was honorable enough to not only sign a deplorable treaty, but follow it to the letter as best possible given the ludicrous and impossible hardships it would cause. 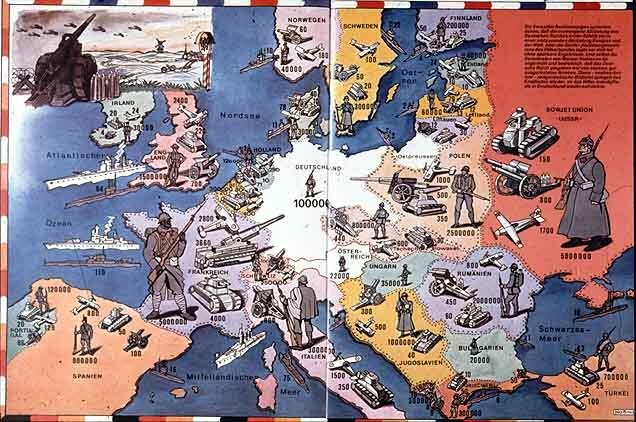 There are references to Hitler wanting to reduce strategic bombing, knowing that it would be an unpredictable weapon and devastate civilian lives - this also was not even considered by the other League states implied in the Treaty. Hitler successfully stopped the usage and proliferation of gas - which he had experienced himself in 1918 - though not via the treaty. As far as I know these two sincere attempts to reduce war production and militarism were the only ones ever brought forth to the League, and both were rejected de jure. My point is simply that, Hitler and the German people were not obliged to support or stand such a treaty that was not only slavish and deplorable but also already dishonoured and broken by all other member states in the League of Nations. That anyone ever accused Hitler of 'breaking' the Treaty to be a dishonourable act (and it was used to bolster the sabre-rattling against Germany in the mid-to-late 1930s) is hypocrisy, pure and simple. If Hitler broke that treaty (which he never subscribed to), how would that have been bad? One issue of breaking the treaty is that, even today, the wording of how it was 'broken' serves as an indemnity to National Socialist Germany, insinuating its hostility towards the world and particularly the nations which it faced in the Second World War. The issue, though somewhat footnoted, is drilled into students' heads in all cursory studies of NS Germany, whether it be in the classroom or in a historical documentary. Just like the Holocaust. Secondly the wording - 'broke,' 'violated,' 'ignored,' are all specifically used to direct public opinion that Hitler and his government were rather brutish and rogue-like in international politics. The truth however is that at first Hitler lead the only movement to actually uphold Section I, Article 8 of the Versailles Treaty. He and his government were obviously disenchanted by the League of Nations and by October, 1933, left the organization and ended the payments stipulated in the original agreement. This is never discussed in or out of the classroom, for obvious reasons. Yes, the wording is leading the witness or student there. To those that are outraged about Germany violating the "Treaty of Versailles" one should pose the question. Were those nations defeated and occupied by Germany in world war II morally and legally obliged to comply with everything the Germans demanded from them, yes or no? Hektor wrote: Yes, the wording is leading the witness or student there. To those that are outraged about Germany violating the "Treaty of Versailles" one should pose the question. Where those nations defeated and occupied by Germany in world war II morally and legally obliged to comply with everything the Germans demanded from them, yes or no? Those nations defeated and occupied by Germany that signed an armistice (like France) or other agreement (like Czechoslovakia) were morally and legally obliged to comply with what they agreed to as written in what they signed. Not "everything demanded of them," as you put it. And that was all they were ever asked to do. I think your wording of the question you want posed leaves a bit to be desired. France was not forced and tricked into signing the 1940 Armistice with Germany, but Germany was forced and tricked into signing the Versailles Treaty (which you agree with, I know). The unfairness of it all has been recognized almost from that very time, but France's PM Clemenceau insisted on holding to the harsh terms because of his fear of any German strength. That's why France deserved it's occupation by Germany in 1940 and got off easy. But I question your assumption that Germany made unreasonable or harsh demands on other countries that they defeated, if that is what you mean. Hektor wrote: Yes, the wording is leading the witness or student there. To those that are outraged about Germany violating the "Treaty of Versailles" one should pose the question. Were those nations defeated and occupied by Germany in world war II morally and legally obliged to comply with everything the Germans demanded from them, yes or no? I think you are missing Hektor's point here, and reading into his post things he didn't say. His question is addressed not to Revisionists but to 'those that are outraged about Germany violating the "Treaty of Versailles" '. He assumes that such people will in general support and justify resistance in occupied countries on the grounds that these terms were imposed, while not allowing the same justification to Hitler and Germany. There is therefore, in Hektor's view, and probably in yours and mine, an inconsistency in their position. I don't see him as taking a position on it himself in his post. I guess Hector can't answer for himself? I know who he was addressing his question to. My comment remains. Kingfisher is summarizing my point quite well. My point is indeed that those critiquing Hitler (or anyone that wanted to get rid of Versailles), will almost always laud any resistance efforts by countries occupied or defeated by Germany. If Germany would have imposed Versailles Treaties on other countries hypothetically, not one of them would hold it against those countries leaders, if they breached that kind of treaties. Hitler and Germany are clearly singled out again. Hektor wrote: Kingfisher is summarizing my point quite well. Hector, I understood what you were trying to say. I didn't need it to be summarized by kingfisher, nor did I want to debate some non-existent point with him. What I'm saying to you is that your wording of "everything the Germans demanded of them" is prejudicial, even though I know you didn't mean it that way. It might seem like nit-picking, but wording is important and those words "what the Germans demanded" stood out to me. We are all agreed, and the title of the thread indicates also, that the Versailles Treaty is bunkum. But TdA points out that what is taught in schools and the media is worded in such a way as to give the worst impression of Hitler's Germany. He makes some very good points, to which you reply that the question to ask is: "Were those nations defeated and occupied by Germany in world war II morally and legally obliged to comply with everything the Germans demanded from them, yes or no?" This definitely sounds like German-occupied countries had unreasonable demands made on them. Yes? Does it not sound that way? It's the wording I objected to. Now you clarify and say: "IF Germany would have imposed Versailles Treaties on other countries, would they not have the right to breach them?" Much better. My point is that it is hoped we don't have to guess at what the other person means (leading to misunderstandings and even disinfo), but that we can speak precisely enough to get across our exact ideas to others. I knew what you meant but I didn't think it was the same as what you wrote. And my other point stands - that when a treaty is gone into under honorable conditions and is fully accepted from the start, there is no excuse for breaching it as long as it's followed by the other party. There was no excuse for some part of the French nation, with the encouragement and help from Britain and the U.S., to disregard their country's armistice with Germany. They are the ones who should be considered war criminals for doing so. That includes Charles de Gaulle and the French resistance movement. You're right. The Treaty of Versailles was broken by all the other member states in the League of Nations. But it's really France's behavior during the Disarmament Conference that blocked the debates and forced Hitler to leave the League of Nations and start to rearm his country. The French representatives at the Disarmament Conference obstinately refused to let their German secular enemies rearm or to disarm their own country as promised at Versailles 15 years earlier. Hitler tried to make them become more sensible for months, but it didn't work. So Hitler left the Disarmament Conference and the League of Nations. Fruitful agreements were impossible to reach with stubborn debatters as the French representatives at the Disarmament Conference. Hitler had understood that and he made the right choice.